Give the guests at your barbecue party the opportunity to laugh, create memories and work off the calories from the deliciously grilled food with entertaining outdoor games that promote physical activity. Organize barbecue- and western-themed activities that allow friends and family members to test their skills while getting a healthy dose of exercise. Take a tip from the Kaboose website and let the guests compete to have the fastest time on a backyard obstacle course. Continue the western barbecue theme and set up a course featuring bales of hay or snake stuffed animals as obstacles. Require each player to ride a broomstick horse around the objects and back across the finish line to complete the race. 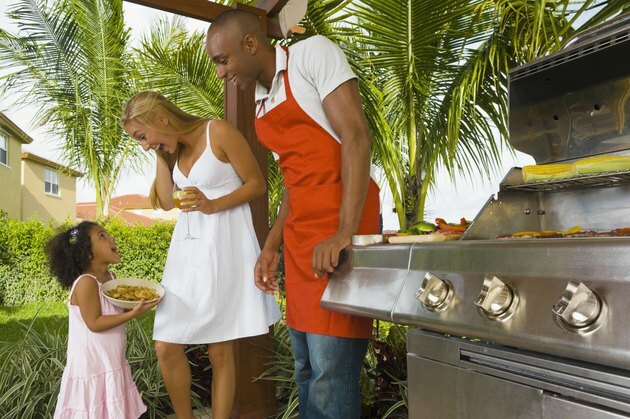 If you’re hosting a neighborhood barbecue party, organize a scavenger hunt that requires the guests to run from house to house searching for objects. The Let’s Party website of the University of Illinois Extension suggests devising a theme for the scavenger hunt and compiling a list of items that teams must collect. Set up a “color” scavenger hunt, for instance, and provide a clue that states, “red mailbox.” Teams must find the house with a red mailbox and take one of the forks sitting inside. Provide another clue that reads, “blue minivan.” Teams should find the van and collect a spoon from a basket beside it. Continue the game until one team returns with all of the objects necessary to eat the barbecue, such as a knife, fork, spoon, napkin and cup. Give the winning team prizes, such as gift cards to a barbecue restaurant. Turn unused dried beans from your barbecued beans recipe into “lawn darts” that guests can use to test their throwing skills in a barbecue party game. Create the darts by placing a handful of beans in the center of a red or blue bandana, gathering up the sides of the cloth and tying it closed with a piece of string. Disney Family Fun suggests placing targets, such as circles of rope or small hoops, on the ground. Assign a point value to each target based on its size or its distance from the throwing line. Give each player 10 tosses and award a prize to the guest with the highest total score. Organize a western-themed variation of the “clothespin tag” game presented on FamilyCorner.com. Divide the guests into groups of four, based on age or size. Give each player four bandannas in a single color, such as red, blue, yellow or green. Instruct the guests to place the bandannas so they’re hanging out of a pants pocket or waistband. When the game begins, players must grab other player’s bandannas while protecting their own—when all four of a player’s bandannas are gone, she must leave the game. The winner will be the last player standing with at least one of her original bandannas.